Vespas. Pizza. Mafia. Alfa Romeo. Ferrari. Spaghetti. Gelato. Armani. These are all Italian things you will commonly find on the streets of America. But would you find as many American things on the paved lane ways of Italy? You might find the odd McDonalds restaurant in the major towns. You’ll also find loads of people wearing Chuck Taylors and Levi’s jeans, but you wouldn’t think you would find a lot of Milwalkee Iron. Or would you? “You actually do see lots of Harley’s being ridden around the streets of Milan” says Samuele Reali, one of the owners of Abnormal Cycles, which is based in a town called Bernareggio, not far from Milano. Abnormal Cycles are quite famous in Europe but recently received worldwide exposure when their ‘Union’ H-D Sidecar took out the 2011 AMD World Championships Modified Harley-Davidson Class. 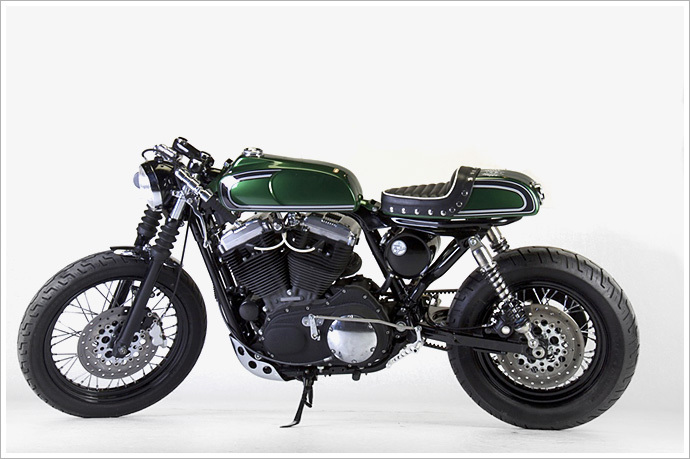 Well, this Harley cafe racer was built before the ‘Union’ and has also picked up its fair share of trophies in Europe. But as I soon found out, there’s not a lot of infomation about the bike anywhere – so I attempted to create find some. Sometimes, when trying to uncover more information on projects from overseas builders, it helps to speak the language – google translate only takes you so far. So recently when I was chatting to Samuele Reali I really wish I had of paid more attention to my Italian teacher at school. Here’s a little more “dettaglio” or details about the build. “The bike ‘Ton-up’ was born from my idea for a friend here around the shop” says Samuele. 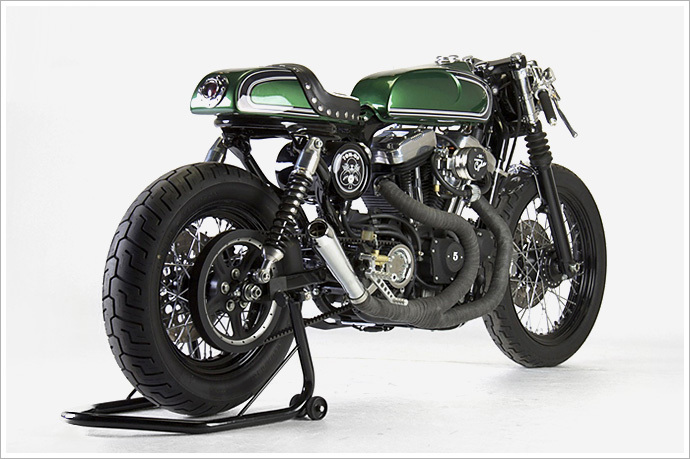 “We like cafe-racer and I find some particular parts in the old market place of bike. I like the slim line and I build this motorcycle in this way.” So the build started by Samuele sourcing many ‘old parts’ for the sporty. “Many parts of this bike we change with old parts… gas tank, seat, rear fender, oil tank, motor guard, exhaust, the controls and the rear light.” Apart from modifying a lot of reissue and old parts, Samuele added some brand names. Like S&S Super D Carburetor, Daytona Twin Tec ignition and of course a set of Tommaselli Clip-ons. Lastly, the stunning paint job was done by fellow Italians Zucchelli Paint. To be honest, this bike could have been a complete disaster. 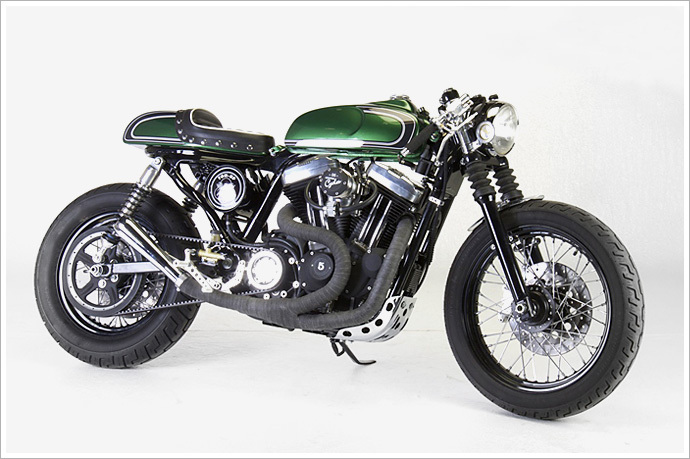 We have all seen it, the combination of a Harley-Davidson and a ‘Ton-Up’ rocker styled cafe racer that usually gets drowned in studs and checkerboard paint. Thankfully this one didn’t. It’s slimline tank and seat combo sits abnormally well over that large v-twin lump. Don’t you just love a good solid serving of Italian? An Italian build isn’t complete without a beautiful women on it.